(Amex/TSX: URZ) Uranerz Energy – Will Uranerz Energy Be Inducted To The Russell 2000 Index Next Month? It’s interesting to observe the technical trading of certain stocks from the end of May until the end of June each year. This annual event impacts the share volumes and prices of many listed companies as fund managers, investors and traders realign their portfolios in anticipation of each company’s pecking order in the family of Russell Indexes. Some of this anticipation trading is to avoid paying higher prices, or to avoid receiving lower prices; later at the end of June as these indexes get finalized, and when index funds have to update their holdings. The balance of the higher-than-usual trading volumes may be attributed to short-term players trading the event, or longer-term investors positioning early, before the index changes are formally announced and then become more widely known. Annual reconstitution of Russell's 25 U.S. indexes captures the 4,000 largest U.S. stocks as of the end of May, ranking them by total market capitalization. Membership in the Russell 3000, which remains in place for one year, means automatic inclusion in the appropriate Russell indexes. Russell determines membership for its equity indexes primarily by objective, market-capitalization rankings. For large-caps the effects may only be minimal. Changes often result in inclusion on an additional index, removal from one of several indexes, or a weighting change compared to other component companies. These one-notch moves up or down are usually not significant either way. However the effects can be a very big deal for small-cap stocks - especially when added to its first index, or when deleted from its only index! Trading volumes, and as a result stock prices, often get a major push as index funds and other players accumulate the stock of new inductees. Conversely, small caps that get bumped entirely from a family of indexes often sell-off as institutional support and trading volumes disappear. What happened to URZ last year, when it was removed from the Russell 2000 Index? 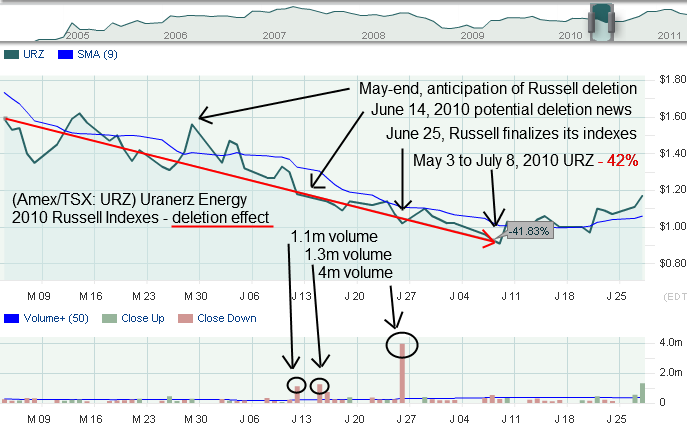 While reviewing past (Amex/TSX: URZ) Uranerz Energy news releases I noticed that on June 14, 2010 Uranerz Energy was identified as a potential deletion from the Russell family of indexes. At that time Uranerz Energy was included in the Russell 3000 Index, the Russell 2000 Index, the Russell Microcap Index, and the Russell Global Index. The URZ chart below indicates a decline of 41.83%, from $1.59 on May 3, 2010 to $0.91 on July 8, 2010. The Simple Moving Average SMA blue line and the Volume-Plus chart confirm a downtrend with URZ closing lower on about three times as many days as it closed up. Notice how URZ’s trading volume started building from the middle of June last year, around when they announced the company may be deleted from the Russell Indexes. Normal URZ volume this time last year was a few hundred thousand shares daily, but on June 25, 2010 the volume spiked to 4-million shares on this URZ down Friday. Russell finalized the reconstitution of their indexes after the market closed on that day and Uranerz Energy was deleted from the Russell 2000 Index. What happened to URZ the year before, when it was first added to the Russell 2000 Index? Now let’s see what happened to URZ the year before in anticipation of, and after, changes made to the Russell Indexes at the end of June 2009. 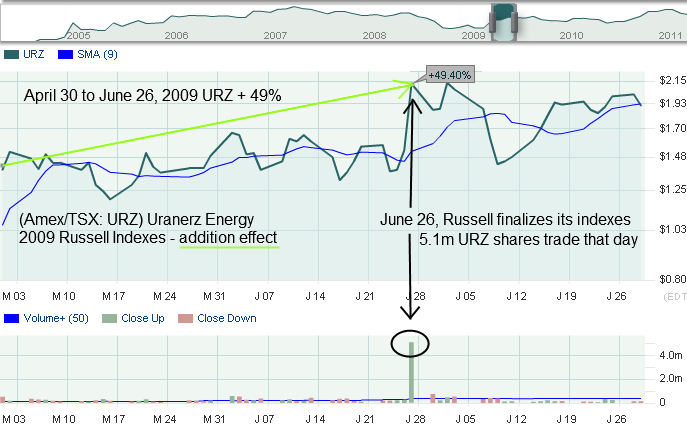 The chart below indicates that URZ increased 49.40%, from $1.39 on April 30, 2009 to $2.13 on June 26, 2009. Russell finalized the reconstitution of their indexes after the market closed on June 26, 2009 and Uranerz Energy was added to the Russell 2000 Index, and other Russell Indexes. Volume spiked again to over 5-million shares on that URZ up Friday. I expect that if we looked at several small cap stocks that were either newly added or removed entirely from the Russell Indexes, that many would have similar price swings from the end of May to the end June each year. On the other hand, perhaps these swings are more the exception than the rule - I don’t know, as I haven’t tested this Russell Indexes addition and deletion effect on many stocks. What does Russell say about the effects of their index changes? From an April 2007 Russell Research Commentary, “Russell Research – Price Pressure at Russell Index Reconstitution”, the Abstract explains how investor speculation, based on anticipated changes to the Russell Indexes, can materially effect stock prices. “The transparent rules of the Russell Index Methodology allow index changes at reconstitution to be anticipated long in advance. Investors in index funds may be concerned about possible losses due to speculative trading around reconstitution. These effects are particularly pronounced in the case of the small cap Russell 2000 Index, due to its popularity and due to the impact of changes at the top end of the index. What does this mean for URZ this June? It does seem fairly clear that when Uranerz Energy has been added to, or deleted from, the Russell 2000, that URZ’s trading volume has spiked - with significant price changes over a relatively short period of time. Please keep in mind these observations are based on past events and obviously there is no guarantee of a repeat performance even if URZ is added to the Russell 2000 Index again. The question now is will Uranerz Energy be added to the Russell 2000 and other Russell Indexes this June? As I understand it, this is based almost entirely on market capitalization at the end of May. The largest 1000 companies comprise the Russell 1000, and the next largest 2000 companies makeup the Russell 2000. It’s basically that simple. What’s not simple is calculating the market-caps for thousands of companies, with ever changing share prices. However for Uranerz Energy, over the past year URZ has more than doubled in price as did the company's market-cap, currently US$ 225 million. It’s hard to say exactly where the Russell 2000 market-cap cut-off line will be this year. Uranerz Energy made the cut back in 2009, when its share price and number of shares outstanding were significantly lower than now. In other words Uranerz Energy has a much higher market-cap now than it did when previously inducted to the Russell 2000 Index. Stay tuned! Sign-up at InvestorsGuru.com for our newsletter or URZ’s News by Email. Free!